Vennesla Library, Norway. Image: NAPLE library buildings database. The concept of information architecture is not new, although the modern use of the term, and the profession associated with it, dates from the 1970s. It is most often applied today to website design; the Oxford English Dictionary defines it as a computing term: ‘the manner in which information is stored, organized, or disseminated, (now) esp. online or on a web site’ (s.v. information, C2, information architecture). Information architecture is, of course, a metaphor; one does not build websites in the same way in which one constructs buildings. In this case, the metaphor is a model: it suggests certain ways of thinking about the abstraction that we call ‘information’. The modern phrase was coined to convey the idea that, just as buildings are designed for storage, movement, and functionality, so analogous design principles apply to the ways we might store, navigate, and use information. Medieval people also used architectural metaphors for textual information. 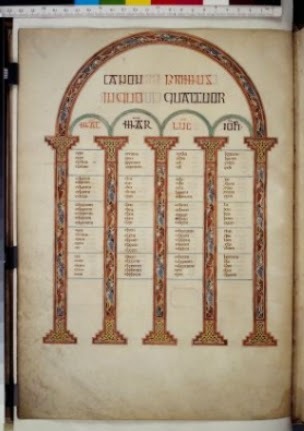 Canon tables, a database-like system of comparing parallel passages in the four Gospels, were typically framed by representations of arches and decorated columns, as if the information floated in an arcaded space. Second canon table from the Lindisfarne Gospels. Image: British Library. They implied that the text of the Gospels was like a church through which you could wander, viewing images and symbols that reminded you of the stories and ideas of the Christian Scriptures. Furthermore, the placement of these images and symbols created relationships between them: for example, a set of images recalling individual Bible stories, perhaps in a window, would assemble these stories into a macronarrative of sacred history whose author was God. East window, York Minster. Image: Chapter of York. 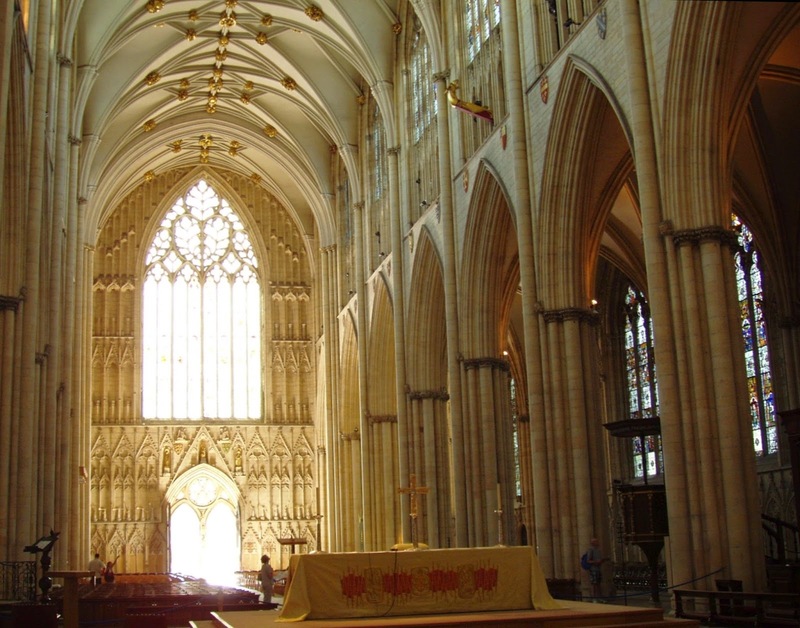 York Minster. Image: Yin Liu, 2006. Sometimes the architectural metaphor was made explicit, as in a passage from the Didascalicon of Hugh of St Victor, an important 12th-century Latin text in which Hugh, a canon regular of the Abbey of St Victor at Paris, set out a guide to an ideal liberal arts education. Hugh compares the text of the Scriptures to a building; the foundation is the literal meaning, the first level of stones is the allegorical meaning, and the rest of the levels are a series of theological doctrines, culminating with the mystery of the Resurrection. There is thus a linear, logical progression in the construction of the building, although all levels of the completed building exist simultaneously in imaginary space and can be navigated in various ways. The point Hugh is trying to make is that the biblical text has layers of meaning; apparent incongruities, especially at the lowest level (the literal sense), are resolved when the architecture of the whole is seen to be the product of sophisticated design. The metaphor of text as building is a natural development of two phenomena. The first is that writing is a spatial representation of information to begin with, and the technology of writing thus encourages the mapping of ideas onto imaginary space. The second, less obvious but probably more important, is a set of memory techniques that go back to classical rhetoric and were known to medieval scholars through texts such as Quintilian’s Institutio oratoria (11.2.18-23) or the anonymous Rhetorica ad Herennium. One common technique was to think of (or go to) a structured space, such as a large public building, and associate the parts of the subject one wanted to remember with specific parts of the building. Thus a topic (Latin topica, from Greek tópos, ‘place’) was an idea associated with or thought of as a specific familiar location. To retrieve the item from one’s memory, one re-imagined the building and the particular spot associated with the topic. 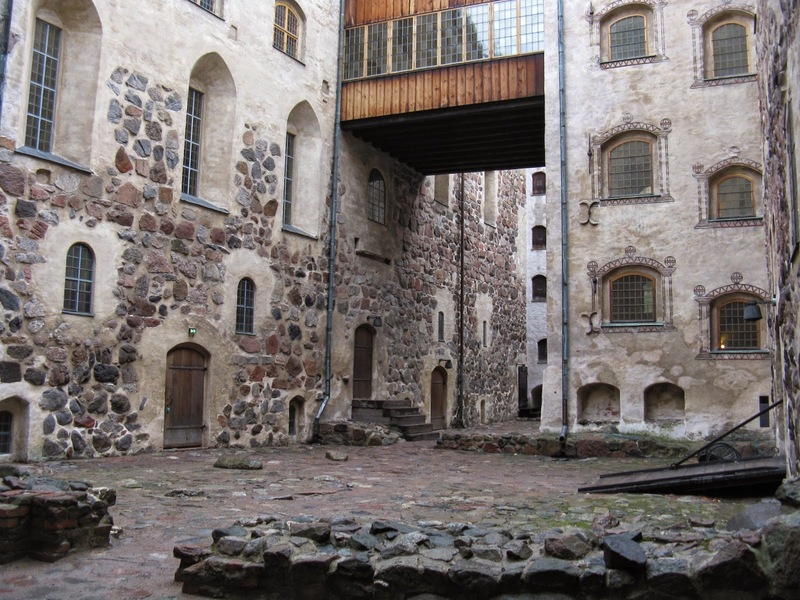 Turun linna (Turku Castle), Finland. Image: Yin Liu, 2014. The models that we use for conceptualising information have crucial implications for the tools and techniques we develop to handle that information. If we think of texts as buildings, for example, then we will tend to make certain assumptions about the structure and functions of texts. Buildings are finite and bounded but also capable of being expanded or renovated. Their construction processes are usually collaborative. They are three-dimensional structures that are subdivided into rooms, passages, courtyards, and the like. The subdivisions of a building stand in particular spatial relations to each other. A building is therefore navigable in ways that are both allowed and constrained by its design. Buildings are places in which we store objects, which we can place in fixed locations or move around from place to place (or we can put things down and then forget where we put them). We organise the spaces within buildings to make things easier to find and to use: we can, for example, create even smaller subdivisions, like closets or shelving units, or we can label areas within a building (especially in large public buildings such as airports, libraries, museums, office complexes, large shopping areas) to help people find their way around. Buildings serve not only utilitarian purposes but also aesthetic ones: we decorate them, we put art on the walls and ornaments on horizontal surfaces, we choose colour schemes. Finally, buildings can be experienced in different ways. The architect is concerned with design, the builder or artisan with specific functions (roofing, plumbing, or whatever) -- but the person who lives or works in the building, or who visits it, experiences the building as a series of interactions with the architectural environment. When an architectural model serves as a metaphor for textual information, therefore, the text also acquires these attributes, both built into its design and experienced by the user. Nevertheless, there exist very different models for text, especially for digital text. One very influential model, for example, defines text as an ‘ordered hierarchy of content objects’ (OHCO): this basically means that a text is modelled as a set of internested containers, capable of being represented visually as a tree diagram. The OHCO model underlies the Document Object Model (DOM) lurking behind web browsers, as well as XML, the markup language most commonly used for text encoding in digital environments. It’s been criticised for all sorts of reasons that I won’t discuss here, but one reason for its success is that it is good at enabling machines (maybe especially machines that run on binary code?) to handle text. Whether it is good at helping humans handle text, even digital text, is another matter. It is rather ironic that modern information architecture, with its focus on website design, tends to default to a tree model of nodes and links, rather than to a truly architectural model. I am not sure that this is inevitable. Medieval people were familiar with tree models; they used them for genealogical and family relationships, for example. I am trying to find out if they ever modelled texts (as opposed to other kinds of information structures) as trees, as the OHCO model does, but I don’t think so, or at least not as often as they used other models. The architectural metaphor, on the other hand, was very common in the Middle Ages, and there were others worth exploring, including the rather subtle ones of text-as-voice and text-as-codex. But if medieval people thought of texts as buildings, consciously or not, that model may explain some characteristics of medieval texts that sometimes seem alien to us: their capacity for expansion and renovation, their collaborative nature, their often complex navigability, their methods of ornamentation, and especially their vulnerability to the messing-about of their medieval users, who continually tried to reorganise them in more habitable ways. For, above all, if medieval texts were conceptualised as buildings, then their users thought of them not as static objects but as places to worship, learn, explore, and live in. Carruthers, Mary. The Craft of Thought: Meditation, Rhetoric, and the Making of Images, 400-1200. Cambridge: Cambridge UP, 1998. For architectural metaphors, see especially pp. 7-24. Eco, Umberto. 'From the Tree to the Labyrinth.' From the Tree to the Labyrinth: Historical Studies on the Sign and Interpretation. Trans. Anthony Oldcorn. Cambridge, MA: Harvard UP, 2014. 3-94. A complex, historically informed, fascinating exploration of the concept of encyclopedic knowledge. Hugh of St Victor. Didascalicon: A Medieval Guide to the Arts. Trans. Jerome Taylor. New York: Columbia UP, 1961. The passage about Scripture as a building is in Book 6, chapter 4. Information Architecture Institute, ‘What is IA?’ (2013). Lima, Manuel. The Book of Trees: Visualizing Branches of Knowledge. Princeton: Princeton Architectural Press, 2014. A history of tree diagrams, in pictures. I am not sure, however, that some images he calls ‘woodcuts’ are indeed so. Renear, Allen H. ‘Text Encoding.’ A Companion to Digital Humanities. Ed. Susan Schreibman, Ray Siemens, and John Unsworth. Oxford: Blackwell, 2004. By the chief champion of the OHCO model. Resmini, Andrea, and Luca Rosati. ‘A Brief History of Information Architecture.’ Journal of Information Architecture 2.3 (2011): 33-46. Yates, Frances A. The Art of Memory. London: Routledge, 1966. The classic book about medieval memory techniques, but see also Carruthers, Craft, above. Hugh of St Victor’s building metaphor in Didascalicon 6.4 is probably an elaboration of a similar idea in Gregory the Great’s Moralia in Job, Prologue 3. See Carruthers, Craft, pp. 18-20.